The great divide of girls & boys gang ( forced though) in REC Kurukshetra meant that the beautiful girls of Fash P & the geeky brains of Technobyte could never come together else even we probably would have witnessed 10 years back a dress which Miss Nicole adorns in the Pic below. The USP of this dress is that it is constructed from 8 meters of the finest French silk chiffon, laden with over 500 Swarovski crystals and over 2,000 LED lights, which lights up to spell out Tweets sent in by fans in real time throughout the evening (via @EE and #tweetthedress).This was during the launch event of 4G by EE in UK. Few months back we did talk about some fashion accessories which do get popularised with politics (political-fashion) but its quite amazing to see this new creation inspired by technology . 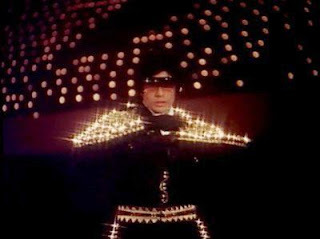 Not that I dont remeber Mr Bacchan's costume from my childhood days which many of us would have been in complete awe of. Do comment on any other such dresses/accessories that you think are Tech inspired. PS: I can though say it with pride that my husband , X-Technobyte member has played quite instrumental(at least thats what he claims :-)) role in 4G implementation in UK.On Look out out for Fash P member. had read about that gown. how about lady gaga's fiber optics wig from here very own haus of collection and the MIT students' virtual hugging jacket?